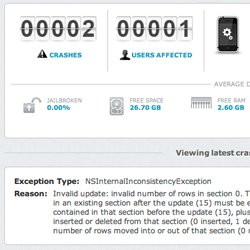 In this second part of a series on iOS Crash Reporting Tools, you’ll learn how to get started with 5 of the most popular services: Crashlytics, Crittercism, Bugsense, TestFlight and HockeyApp. Thanks for joining me for the second part of this two-part series on crash reporting services! The first part introduced you to the architecture of crash reporting services, including storage, symbolication, and server-side management. As well, I provided a basic overview and comparison chart of the most popular crash reporting services today. In this second part, I’ll take you through the steps to get started with each service covered in the last article: Crashlytics, Crittercism, Bugsense, TestFlight and HockeyApp. This particular app has been constructed to generate crash events. That’s bad news in the real word — but for our purposes, it will serve perfectly! 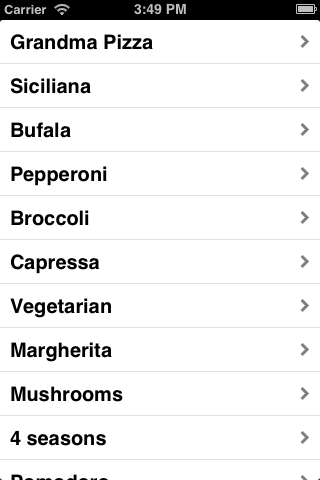 Swipe to delete a pizza from the menu. Scroll to the bottom to load more pizzas. The code for our pizza application can be found here. Download the project, then build and run in the simulator. To cause a crash, swipe to delete a row, or simply scroll to the bottom of the list. 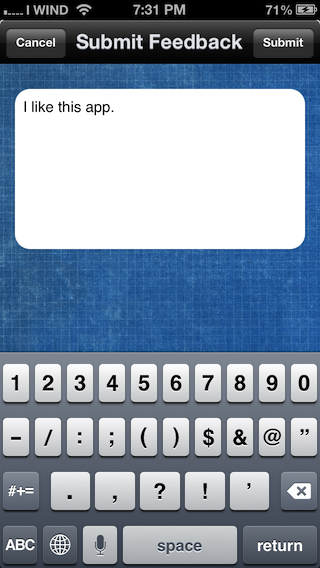 Note: The sample app is designed to run on iOS6 and above. If you are testing on an pre iOS6 device, you will need to disable AutoLayout. Although I know it’s killing you not to fix the bugs, don’t! You want the application to crash so that a reporting tool can help you to identify the source of the problem. Before continuing, make sure you create an account with each of the crash reporting frameworks and download each of the crash reporting SDKs. Once you have a set a custom bundle identifier, make sure to make a backup copy of the project. Each framework has their own installation instructions so it is best to use a “vanilla” project with each demo. In order to test out these crash reporting frameworks, you will need to run the app on a real device. This requires an Apple developer account as well as a provisioned device. If you are a new to iOS development, you can learn how to create a developer account, as well as provisioning your own device in this tutorial. 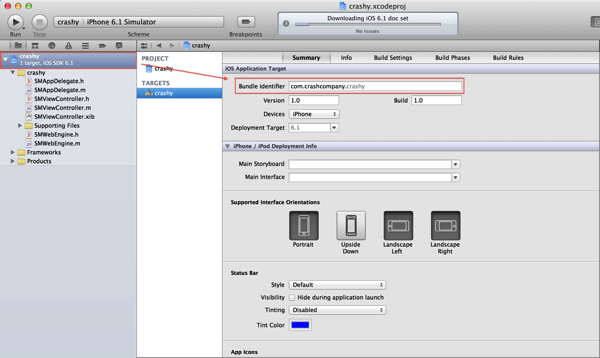 Note: During this tutorial, do not run the application on the device through Xcode. 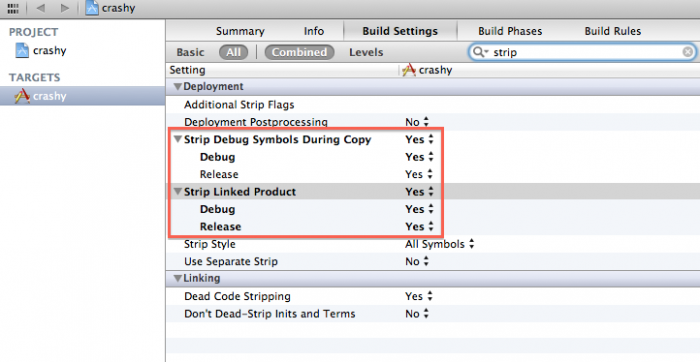 Xcode will intercept the crash, then open the lldb debugger shell as usual. 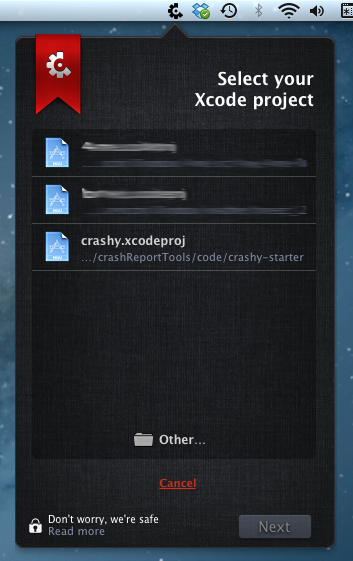 You won’t get any crash reports if Xcode intercepts the crash event! To make all the examples below work, you have to build and run the application, then click the stop button on Xcode. This way you will have the latest version installed on the the device. Once that is done, you can launch the app on the device itself, and then crash it all you want! Build and run on Xcode. Run the app on your iOS device. Recently bought by Twitter, Crashlytics is pretty famous in the iOS community. It’s used by well-known companies such as Path and Yammer. It is a full-stack service, meaning that the framework provides both client-side and server-side parts. 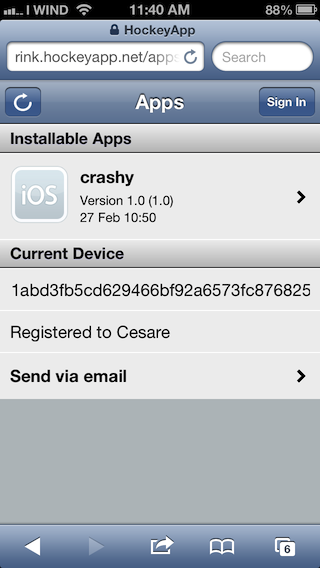 At the moment, Crashlytics supports only iOS, although the website does indicate that Android support is coming soon. Once you have logged into Crashlytics, you will be prompted to download a Mac OSX application that will help you to set up your first project. Click the “Other” button at the bottom to open a Finder window. 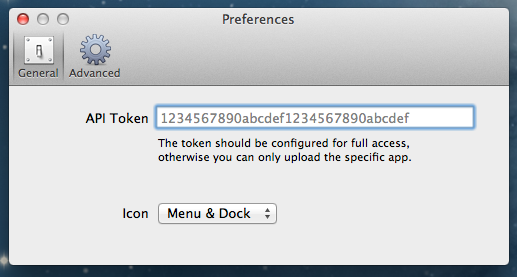 Select the .xcodeproj file and click “Open”. Select your project from the list in Crashlytics and hit “Next”. This will automatically open the project in Xcode and ask you to add a script to the Build Phase. From this point onward, the Crashlytics app will walk you through each step of installation process. Follow the instructions, and when you’re done, continue with the next step of the tutorial. Now that you’ve completed the setup portion, you are now ready to try out Crashlytics. 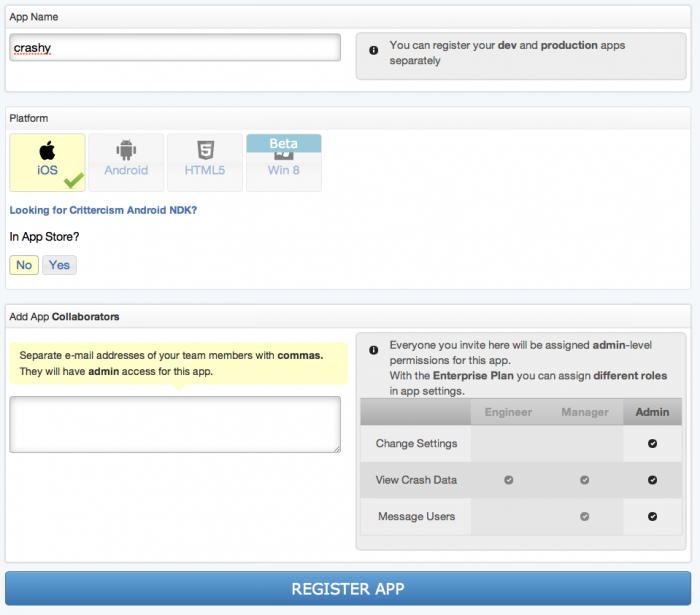 Run the application on your iOS device, swipe on a cell and tap Delete. The application will crash, as expected. 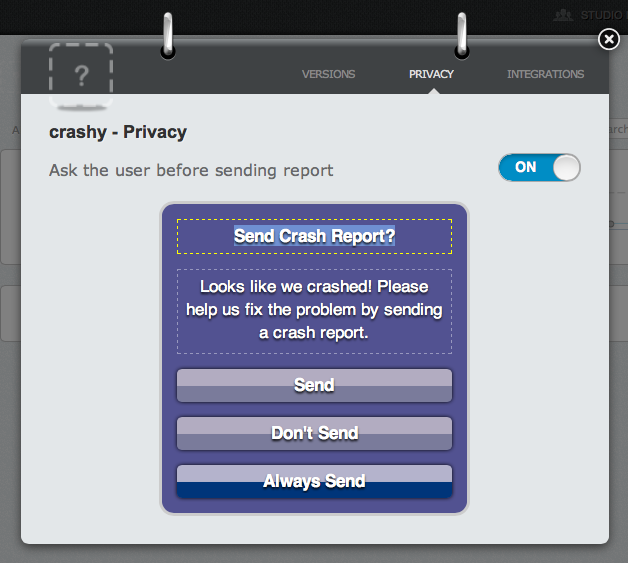 Restart the app and wait about a minute to make sure the crash report has propagated to the Crashlytics server. Then take a peek at the website to see if the crash report is live. You should also receive an email notification about a new crash in your application. At first glance, you will see the guilty line of code (SMViewController.m at line 80), the number of users affected, and the number of occurrences of this crash. Launch the app and make it crash again. You’ll now see the number of crashes of the same issue increase. On to the second bug! Next, modify tableView:willDisplayCell:forRowAtIndexPath: in SMViewController.m as follows. 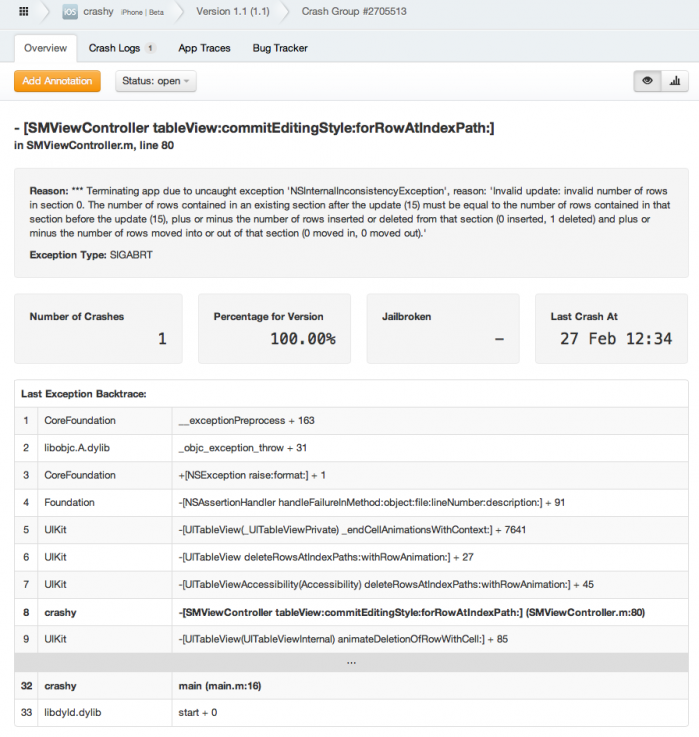 CLS_LOG is a macro provided by the Crashlytics framework that enables remote logging. In debug builds, it acts just like NSLog, passing strings to the console. For release builds, the log is sent along with the crash reports and optimized to be as fast as possible. In fact, Crashlytics’ own documentation boasts a 10x improvement over using regular NSLog() calls. The method also uses custom logging which allows you to store information in key-value form. Think of this as a type of NSDictionary on the web server: you set the values of keys in the code, and you can read the values on the server when hunting down a bug. In this case you are using setIntValue:forKey, but there are other methods available to store objects, floats and booleans as well. 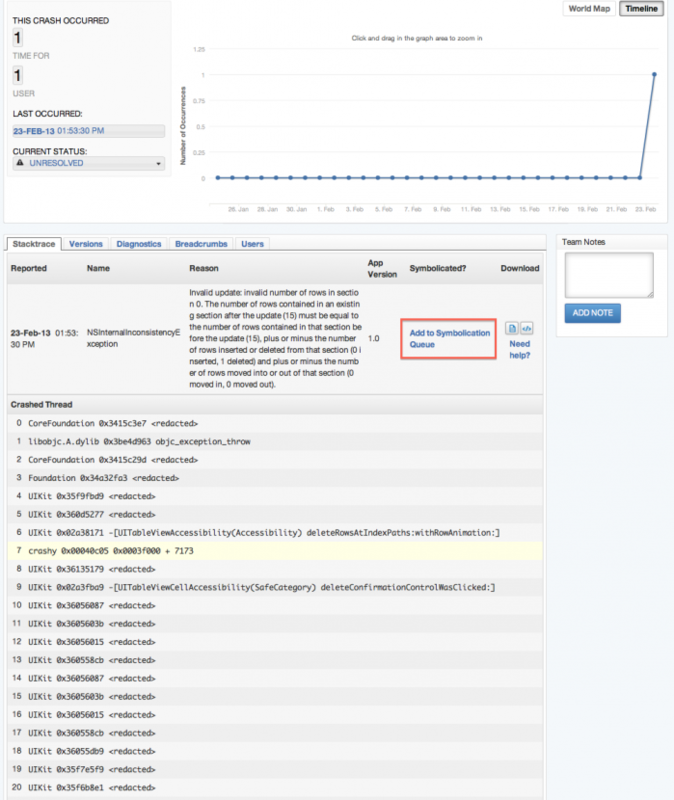 You can find more details about custom logging in the Crashlytics knowledgebase. Run the application in Xcode and then stop it. Run it again on your device, scroll to the bottom, allow the app to crash, and restart the application after the crash. It is clear that this is due to the lack of the method definition loadMore in SMWebEngine.m. If you were to add the definition for this method, and the crash would disappear. Although that’s not the point of this tutorial, so don’t worry about actually implementing it! Notice that the detailed view of each issue provides information about the device like iOS version, and free space on disk and in memory. All these details might help you when you are hunting down the root cause of a crash. This way you can have a path of breadcrumbs that can help to hunt down the cause of the crash. It is important to note that logs and keys are sent to the server as attachments to a crash log, so you won’t see them if there aren’t any crashes. 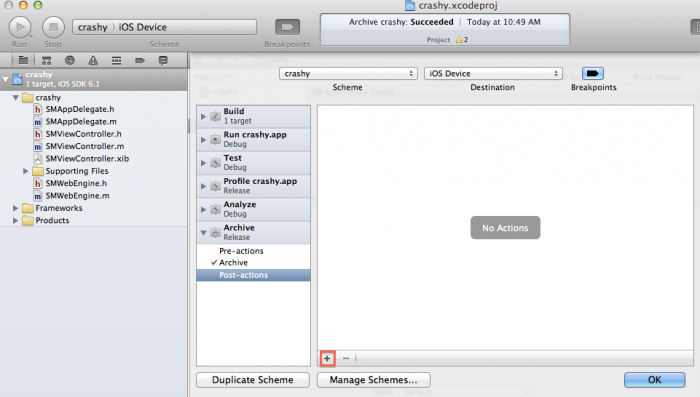 Crashlytics, unlike other services like TestFlight, is not a generic remote logging application, but rather a true crash reporting application. So even though your app may be full of logging statements, if the app never crashes, you’ll never see any of your logs! This way, you can identify who is experiencing a crash, and contact that tester to get more details. This concludes the guided tour of Crashlytics. 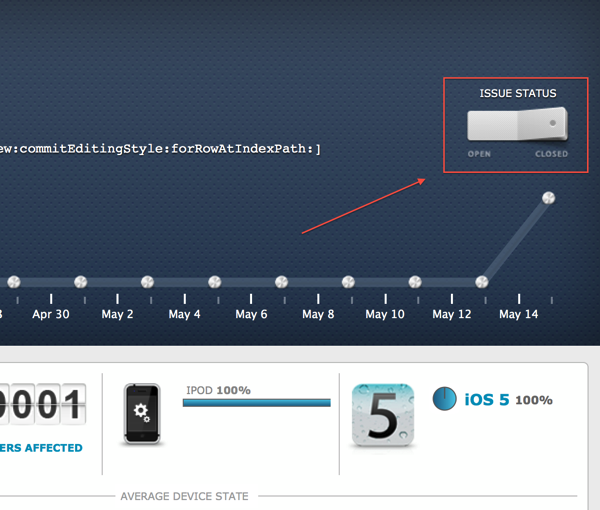 If you are just targeting the iOS market, I highly recommend that you consider Crashlytics. The service is very quick to upload crashes, there are no hassles with dSYM files, and the back-end service is quite intuitive. Crittercism is another full-stack tool to keep track of your crash logs. It has been adopted by companies such as Netflix, Eventbrite and Linkedin. It provides support iOS, as well as Android, HTML5 and Windows 8 (which is in beta at the moment). 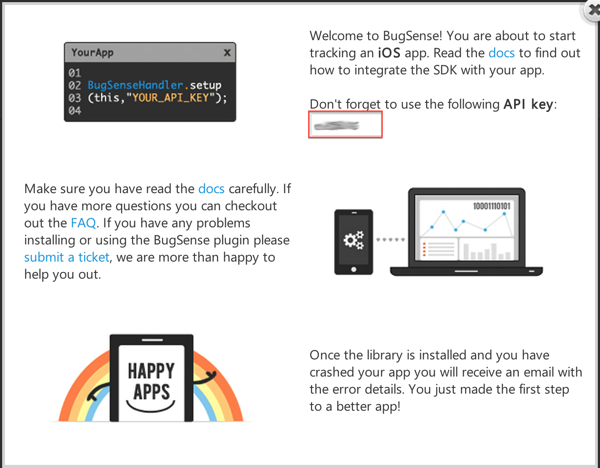 Download and import the SDK. This will ask you to assign a name; for this project, put “crashy”. 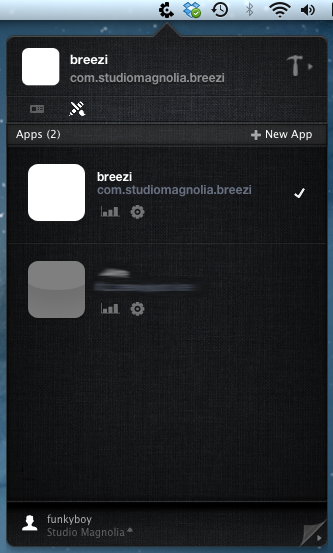 Then select the iOS platform, and don’t bother to invite any collaborators. You’re just testing the application, so choose No for the question “In App Store?”. When you’re done, click the big blue Register App button at the bottom. 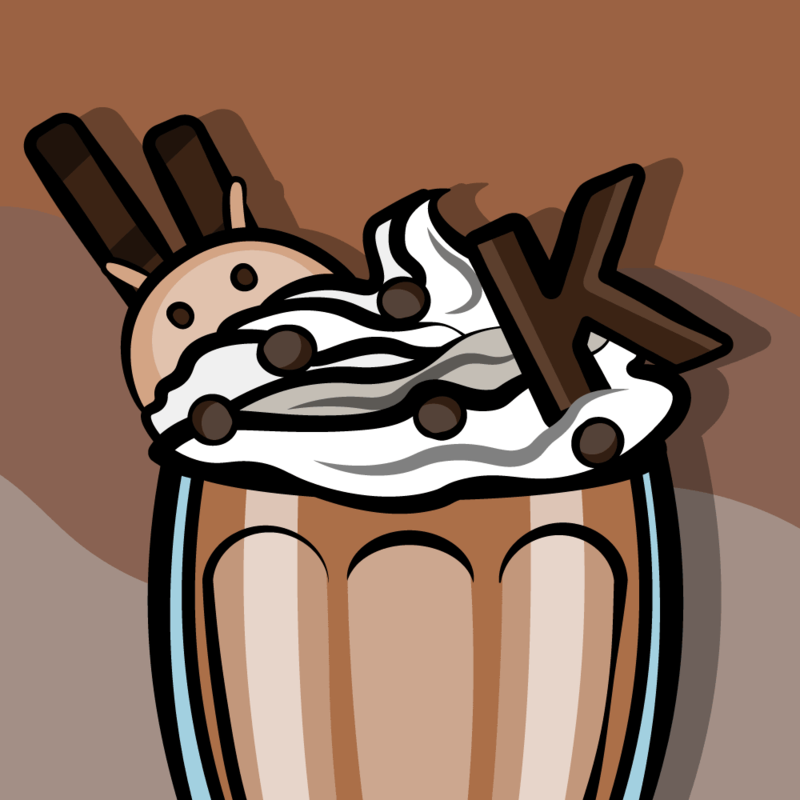 Next you will be prompted to download the most recent version of the SDK (which is 3.5.1 at the time of this writing). Here’s the link to the download page, just in case. 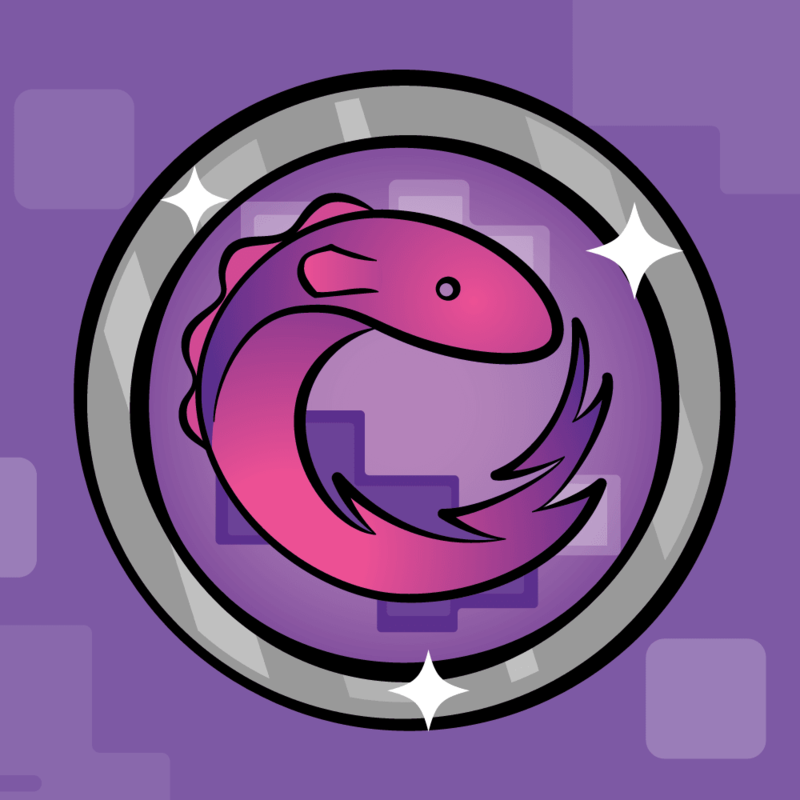 Open a new, unfixed copy of the crashy-starter project in Xcode, unzip the Crittercism SDK, drag and drop the folder named CrittercismSDK onto the root of our project, and make sure “Copy items into destination group’s folder” is checked. 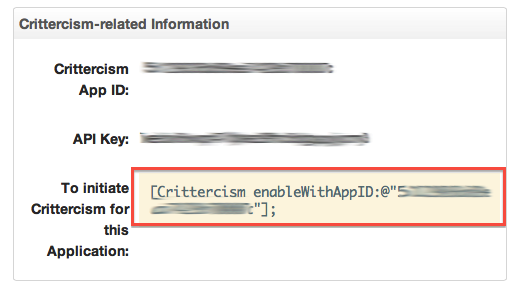 And that’s it, your project is configured to work with Crittercism! 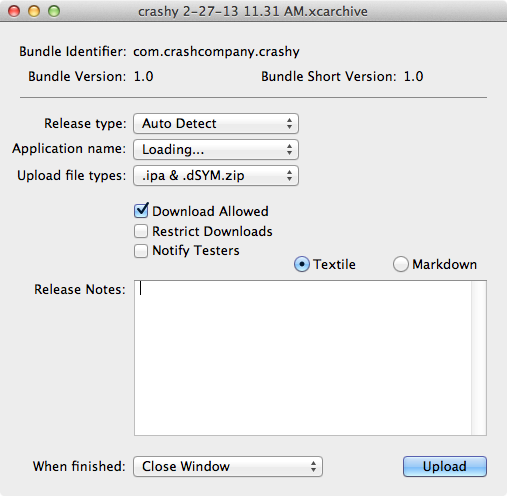 Unlike Crashlytics, you have to manually upload your dSYM file to the server. To find the dSYM file, follow the instructions in the first part of the tutorial in the Symbolication section. Note: If you are still having problems uploading your dSYM file, check out this YouTube video that screencasts the process, step by step. Let’s start by tracking down the first bug. 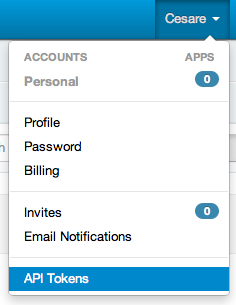 The “Reason” column should lead you to think there is an issue with the table view. You might see more details, but the log is not yet symbolicated, so you don’t know which file and line of code is responsible for the crash. 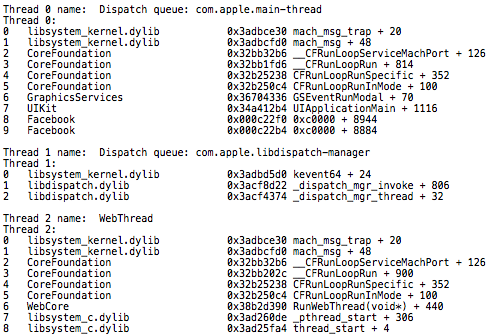 One shortcoming of Crittercism is that I couldn’t find a way to queue crash logs automatically as they get uploaded. If you’ve found a way around this, please let me know in the comments! 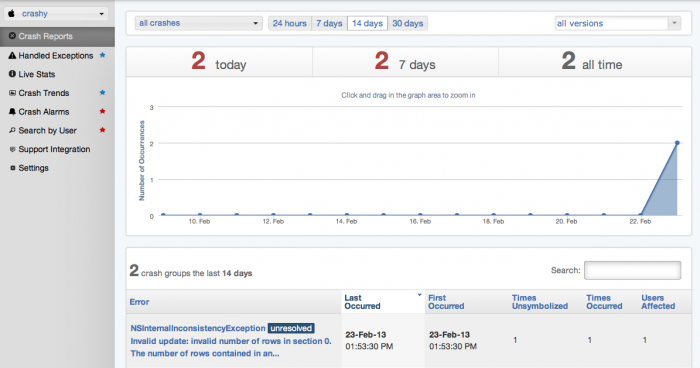 Crittercism also offers breadcrumb logging for enterprise accounts and an assortment of other features. This concludes the how-to portion on Crittercism. 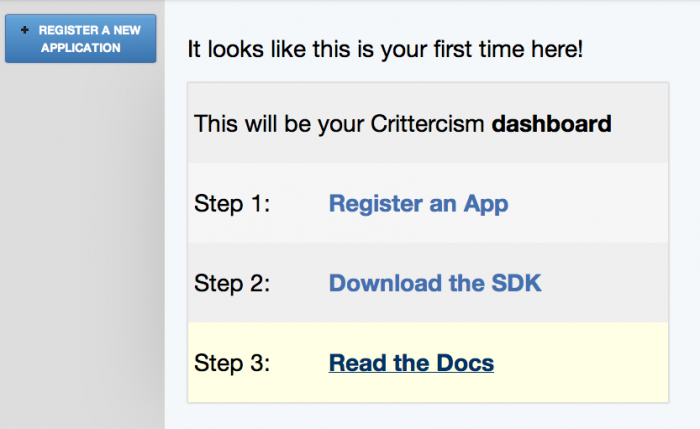 The Crittercism framework also supports Android, Windows 8 and HTML5. I’ve found that the user interface for the back-end is a bit complex, requiring a few extra clicks to get to the required information. It’s a bit clumsy to manually upload the dSYM for each build, but overall, it’s a solid framework. Okay Class — Time for a Break! Okay, it’s time for a short break from your crash reporting studies. Answer the following tricky question. Bugsense is another full-stack service, used by big companies such as Samsung, Intel and Groupon. It supports iOS, Android, Windows 8, Windows Phone and HTML5. Copy down this key as you’ll be needing it later! Unfortunately there is no direct link to download the SDK, so you will have to click the Docs item in the top right bar of the dashboard. This will open the generic documentation page, from which you have to select iOS. You will end up at this link. This page should contain a URL to download the iOS SDK (which is version 3.2 at the time of this writing). 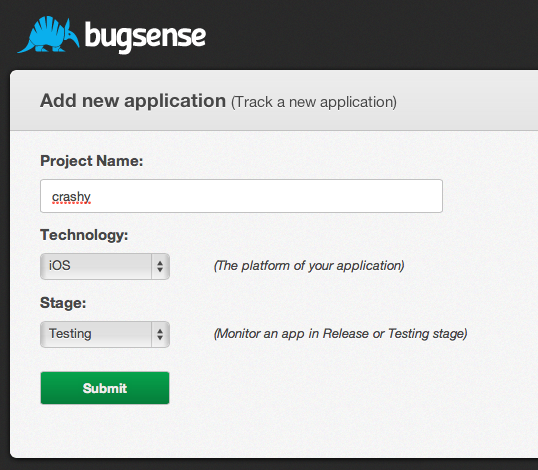 Now you’re ready to test Bugsense with your first bug! The stack trace as shown is complete, but has not yet been symbolicated. Click the Symbolicate link on the top right. In this case, it will fail to symbolicate the trace because the dSYM is not yet on the server, and the button will turn green with a label of “Upload Symbols”. Personally, I am a bit concerned about the UDID, which has been deprecated since iOS5. Bugsense also supports breadcrumbs, but they are only accessible in higher paid plans. This ends the how-to portion of Bugsense. The platform is quite feature-rich and supports Windows8, Windows Phone and HTML5. A desktop application to automate the upload of dSYMs would definitely be appreciated, as well as the automatic symbolication of crash logs when they are received on the server. TestFlight was born as a tool to manage the distribution of beta releases. Over time the developers added many more features, like action logging and crash reporting. TestFlight has been adopted by companies such as Adobe, Instagram and tumblr to manage over-the-air deployment, tracking and crash reporting. iOS is the only platform supported at the moment. As mentioned in the previous part of this article, TestFlight is a bit more than a crash reporting system, for it also allows you to recruit testers and distribute your test builds. Once you have logged in, head to the SDK download page to download the SDK. The current version at the time of this writing is 1.2.4. Open a new copy of the starter project, unzip the TestFlight SDK, drag the entire folder onto the root of the project, and make sure “Copy items into destination folder (if needed)” is checked. Compile the application using Cmd+B to check if everything is ok. Next you’ll need a particular token to make your app work with TestFlight. To get this token, go to your TestFlight team dashboard and copy the team token displayed. That’s the key you’ll need to initialize the framework in the code. Now you're ready to test the application against the first bug. I suggest you download and install the companion desktop application before doing this, which you can download from here. This app is smart enough to detect when you have archived an application and offers to upload both the .ipa file and the dSYM. This will save you some pointing and clicking on the TestFlight website. 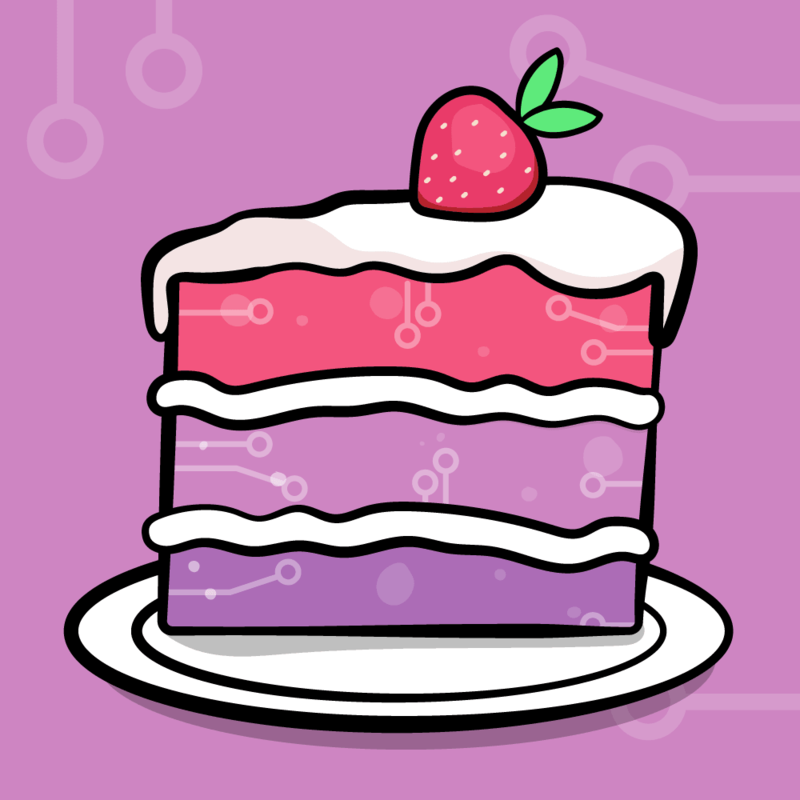 If you've never set up a binary for adhoc distribution, TestFlight has provided some detailed instructions to get you started. If you use the desktop application (which I highly suggest you do! 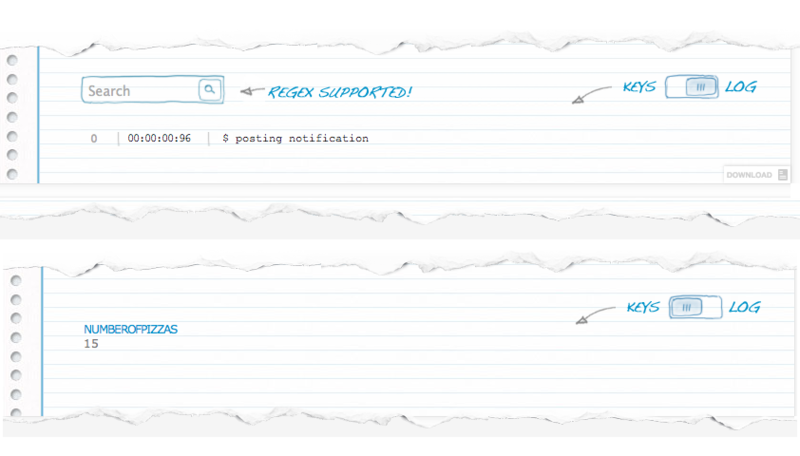 ), follow the wizard's instructions and at the end you'll be prompted to copy out the share URL. That's the URL of the new build you've just submitted — you can send this link to your testers. Note: Crash logs sometimes take a while before showing up on the web interface. 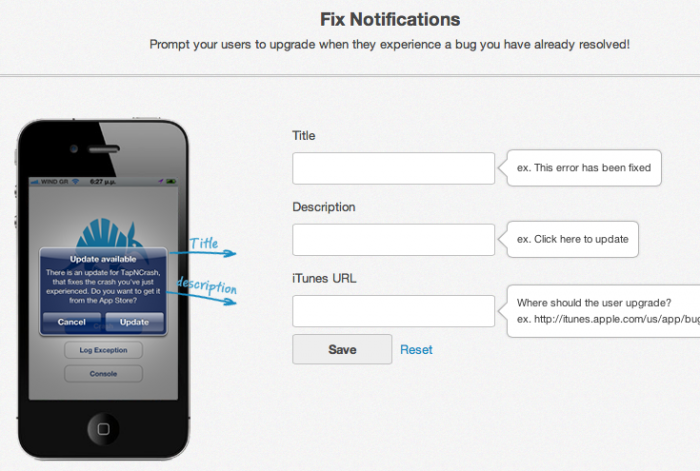 TestFlight support indicated that these issues will be resolved in the next release of the SDK. A menu on the left gives you an overview of the data related to the build, such as the number of session and the total number of crashes. 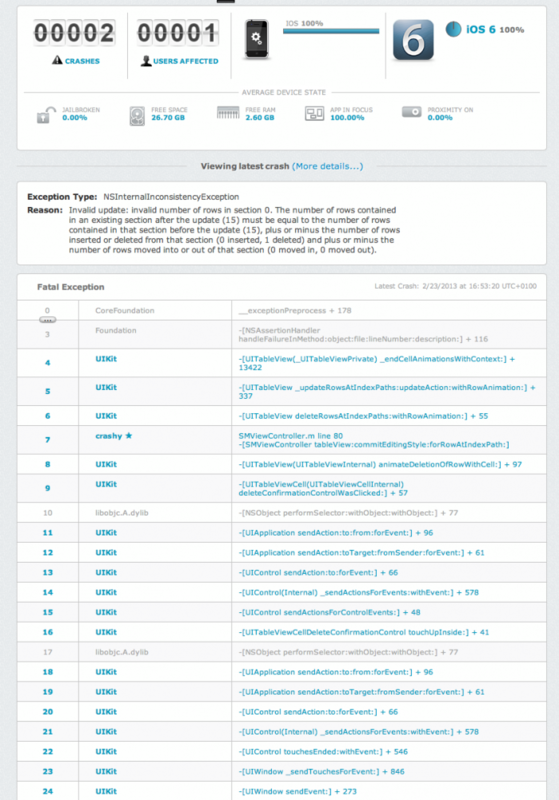 In the middle section you can see the list of users and on the far right, a summary of the recent activity performed on the application by users. Another interesting feature in TestFlight is the ability to add checkpoints. Checkpoints are much like breadcrumbs or events - you spread some log statements in key places in your code to get a better idea of what happened before a crash. To place a checkpoint in your code, use the method passCheckpoint. 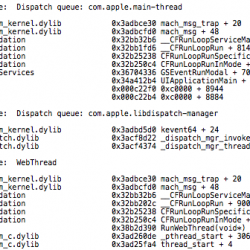 TestFlight is a complete service that covers distribution, crash reporting and remote logging. However, I have noticed that sometimes the dSYM is not uploaded successfully by the desktop application and you'll have to re-upload it using the website. HockeyApp supports iOS, Android, MacOS, and Windows Phone. 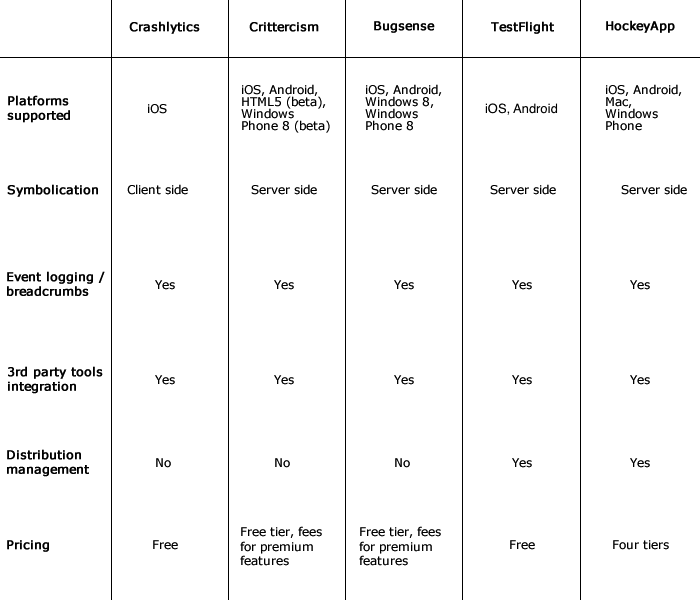 HockeyApp, like TestFlight, is more than a crash reporting tool. It also allows you to manage the distribution of builds to beta testers, as well as providing a platform to collect feedback. Configure your project with the API token. Leave the settings at their defaults (All Apps and Full Access) so that the API key will give you what is effectively “root access” to the platform. 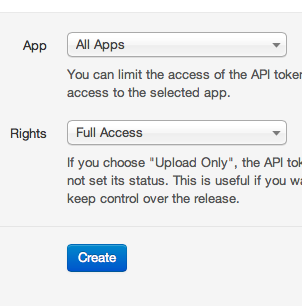 Click “Create” and the API token will appear. Copy it and save it somewhere. Unfortunately there is no direct download link for the desktop application, but the link should be available in the "Installation" section on this knowledge base page. How cool would it be if after every archive was built in Xcode, the HockeyApp desktop app opened automatically, ready to upload the new build? Well, you can do that! As you can see, the desktop application has automatically detected the applicationID, version number and has located both .ipa and .dSYM files to be uploaded on the server. Make sure “Download Allowed” is checked, and click Upload to send it to the server. Notice that users and devices have been automatically detected. Neat! Copy the “App ID” and save it somewhere. You'll need it to configure the crash reporting system. Now the application is ready to be distributed. You'll find the download phase to be quite streamlined as well. Tap your app to install it and check that it runs correctly. So far you have been dealing just with the distribution part. It's time to integrate crash reporting. 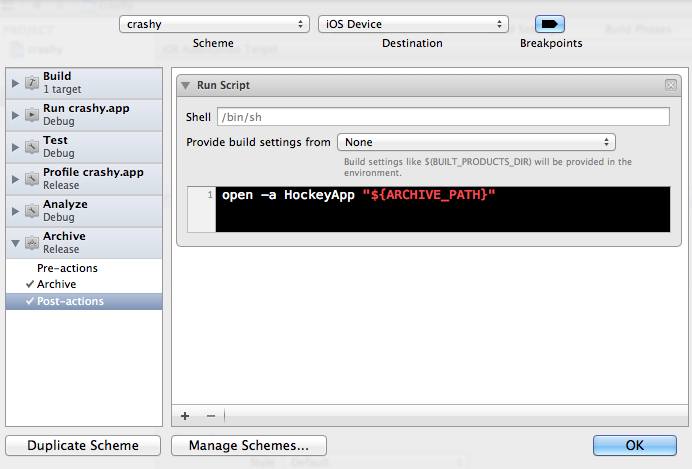 Head to http://hockeyapp.net/releases/ to download the client SDK for iOS (the current version as of this writing is 3.0). Download the binary version and unzip it. Drag and drop the folder HockeySDK.embeddedframework onto your Xcode project and make sure “Copy items into destination group's folder” is checked. [[BITHockeyManager sharedHockeyManager] configureWithIdentifier:@"YOUR APP ID"
All of this code will allow you to collect data about the user installations only when the build is not targeting the App Store; that is, when you are in the beta testing phase. To distinguish your new app version from the old version, update the app version in APPNAME-Info.plist. Now you are ready to test your first crash report! First, archive your application and use the desktop application to upload it to the server. On your device, delete the previous version of your pizza app, and open the web clip that was previously installed to your device. Alternately, you can visit https://rink.hockeyapp.net/apps to do the same thing. There you will see the new release. Once you have fixed the bug, you can close it using the status drop-down at the top left. For the next crash, you will implement some logging. HockeyApp does not include a built-in logger so you will need to add one. You will use the well-known CocoaLumberjack. Download the zip file from GitHub, unzip it, and drag and drop the folder named “Lumberjack” onto the project root. The first method retrieves logged contents from a local file, while the second method implements a delegate method for the crash manager of HockeyApp. The application is now set up to collect logs locally using the Lumberjack framework, and to send them to the server via the HockeyApp framework. This small logging statement will tell us if the view loaded successfully or not. But as it stands, you won't actually be able to see that log line because the log level has not been set. Add the following code directly after the #import statements in SMViewController.m. I generally set the logging level to verbose, since I prefer to have as many details as possible when debugging. This will log the number of pizzas before the notification is posted. Note: DDLogError is the only macro that works synchronously, so you can call it even right before a crash. All the other methods such as DDLogVerbose and DDLogInfo are asynchronous, so they might not do their job if they are called immediately before a crash. Now update the application version, archive it and let the desktop application upload it to the server. Delete the old version on the device and install the new one using the web clip. Note: HockeyApp will detect older versions of a build and will prompt you to update the build from within the app itself. This happens behind the scenes once you upload a new version, so users will not have to manually visit a web address. They just need to launch the app. Pretty convenient, eh? Sometimes applications crash during startup. That makes it impossible to send reports to the server, because the application literally has no time to detect a previous crash and send it over-the-air. HockeyApp is the only tool that allows you to delay the initialization phase (and thus delaying the crash) and gives precedence to the “send to server” procedure so that your crash reports can be uploaded. You can find some more details on handling startup crashes with HockeyApp here. HockeyApp is a great tool to manage distribution, remote logging and crash reporting. A disadvantage of the service is that it does not include built-in logging. I really appreciated the automation of hooking up with the archive action of Xcode, which saves you some time and stress when you create a new build. Sometimes the information you need is a bit hidden, such as remote logs, and requires quite a number of clicks to be displayed. I have already expressed my preference for Crashlytics if you need just crash reporting and logging, but I'd definitely consider HockeyApp if you need also distribution management. I'll confirm the verdict that I expressed in the first tutorial: Crashlytics is an excellent solution if you need to be up and running quickly and you like a well done back-end. If you need more than just crash reports and remote logging, and if you are targeting platforms other than iOS, HockeyApp and Bugsense will work really well for you.